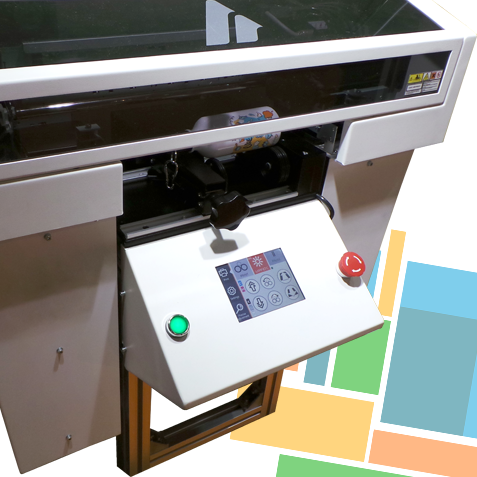 The possibilities of digital printing have now been doubled with specially designed rotary adapter. Rotax allows printing on a vast range of cylindrical objects with diameter ranging from 41 mm to 127 mm and height up to 279 mm. Print on cylindrical and cone objects such as beer and wine glasses, cups, candles, tube, cans, tanks, vases, awards and much more. Rotax makes cylindrical printing efficient and precise by delivering both white and full color prints. 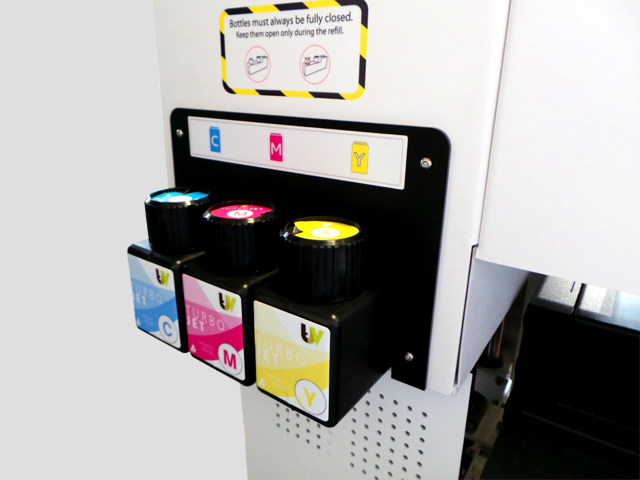 Always striving to meet versatile requests of our customers, MaQeo WDTO comes with 500 ml bulk-ink system. In order to maintain accurate high-quality printing even during long production runs, MaQEeoprinter incorporated six specially designed bulk ink tanks with monitoring sensors which are built to meet the demands of high volume operations. Each tank holds 500 ml of ink which is extremely easy to handle and remove. 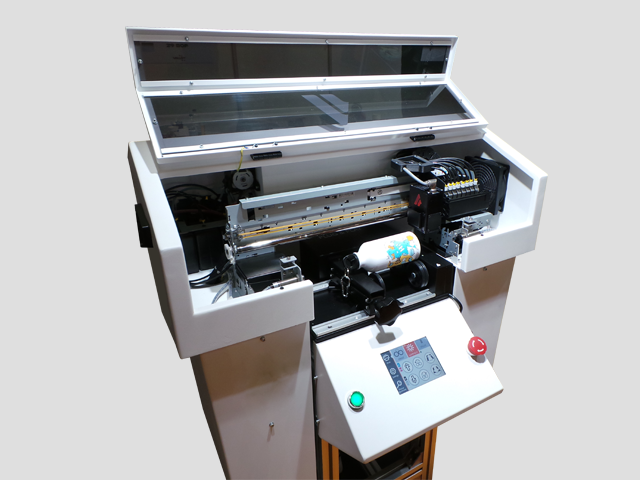 MAQEO’s unique automated ink recirculation system circulates the white ink in the machine on every start up and shut down of the machine to prevent the ink settling. 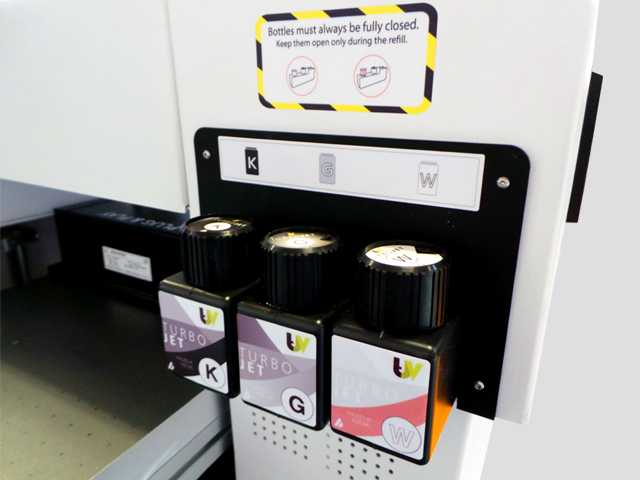 Ink tanks can be refilled from ink bottles, ink waste is minimized and you can print continuously without interruptions. 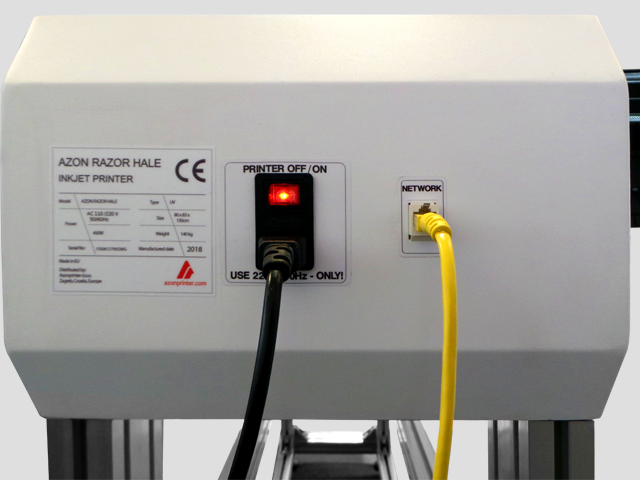 In addition, this system controls the discharge of white ink, reducing ink waste and eliminating manual maintenance. 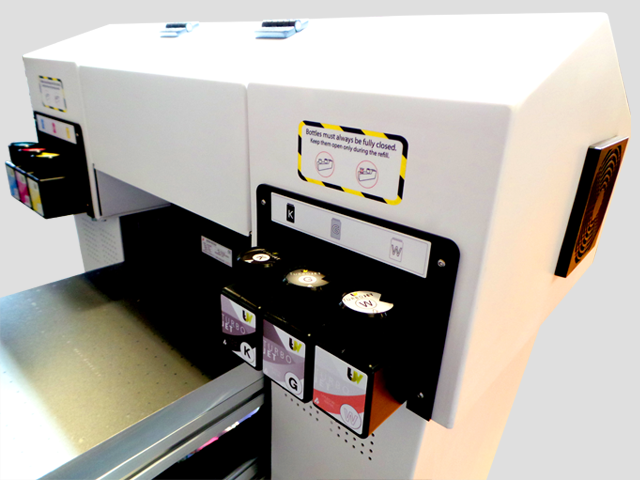 In order to meet customers business requirements, ink configuration comes in two options: CMYK+ 4x White or CYMK+2x White + 2x Gloss. New UV TurboJet ink which will be available for the new WDTO improves the quality of print dramatically. Vibrant and colorful prints can be expected on any type of material: stone, glass, wood, plastic, aluminum, metals and canvas regardless of indoor or outdoor use. The versatility of white ink as a base for high-density CMYK layer delivers unusual and creative textures on all materials. WDTO MAQEO launched the perfect fit, so far a complete full-featured MAQEO RIP software and it is offering different features, tools and add-ons like printing up to 5 layers in inline mode depending on resolution, fading and changing the number of used nozzles, creating emboss or raised print up to 2mm allowing customers on that way to print any ADA- compliant and Braille script standard requested, fading and number of used nozzles, creating embossed or raised print up to 2 mm, decreases the needs for Illustrator, CorelDraw, Photoshop and so many more. MAQEO RIP allows users to instantly choose the proper settings for their most popular applications which dramatically increase the printer’s productivity and overall performance. Meeting the increased demands of fast-growing market MaQEeosuccessfully prepared new upgrades to rise up productivity and profitability of its solutions. MaQeo WDTO is combining more superior laser auto heights sensor adjustment. The improved vertical movement achieved with one motor provides more precise, faster and secure operating. 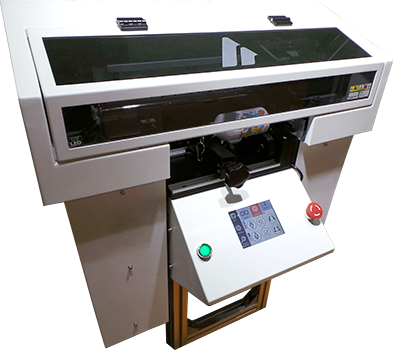 The possibilities of digital printing have now been doubled with specially designed rotary adapter. Rotax allows printing on vast range of cylindrical objects with diameter ranging from 41 mm to 127 mm and height up to 279 mm. Print on cylindrical and cone objects such as beer and wine glasses, cups, candles, tube, cans, tanks, vases, awards and much more. With the new rotary adapter, it is possible to print more varied print applications. 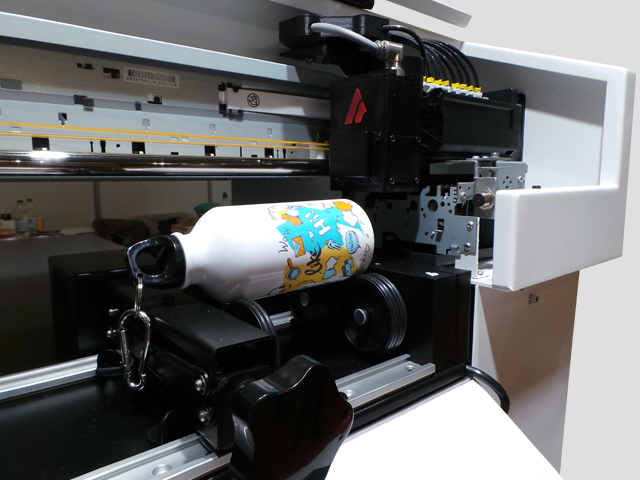 Rotax makes cylindrical printing efficient and precise by delivering both white and full-color prints. Rotax attachment is easy to install, quick to mount and smooth to operate. Simply mount the adapter on the printer and insert a connector. Max thickness: 200 mm (7.9 ). Printable media: Glass, metal, stone,wood, plastics. Ink type: LED UV 500ml bottles.